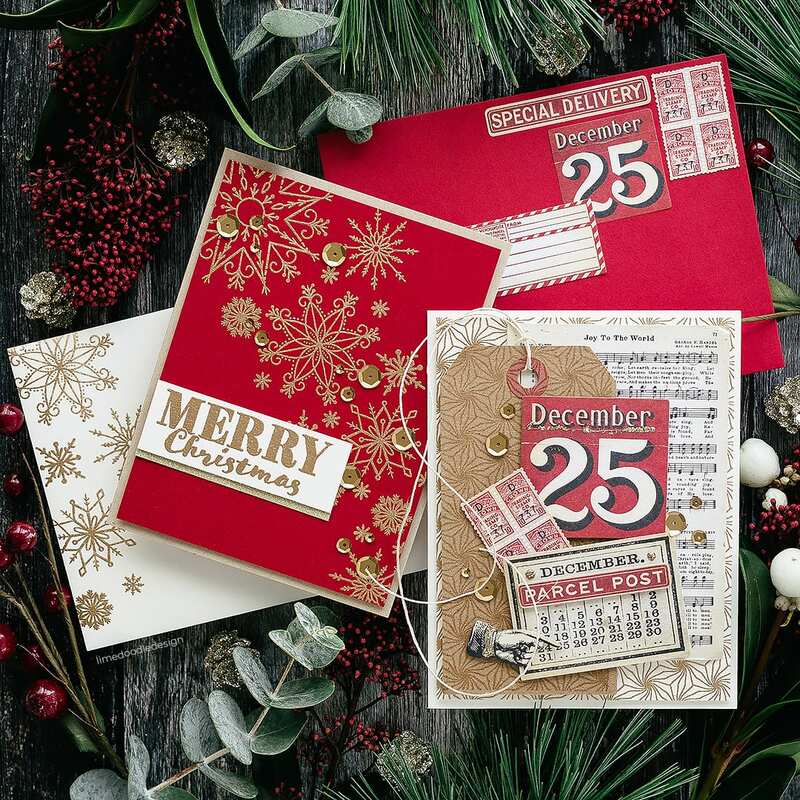 I loved putting these vintage inspired Christmas cards together using the new Limited Edition Holiday Card Kit from Simon Says Stamp. 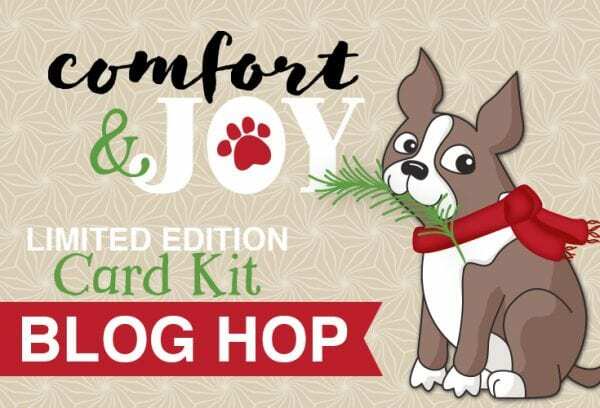 This post is part of a blog hop to celebrate the release of the kit and there’s more information on the hop below. I’ve linked all supplies at the end of this post. Compensated affiliate links used. 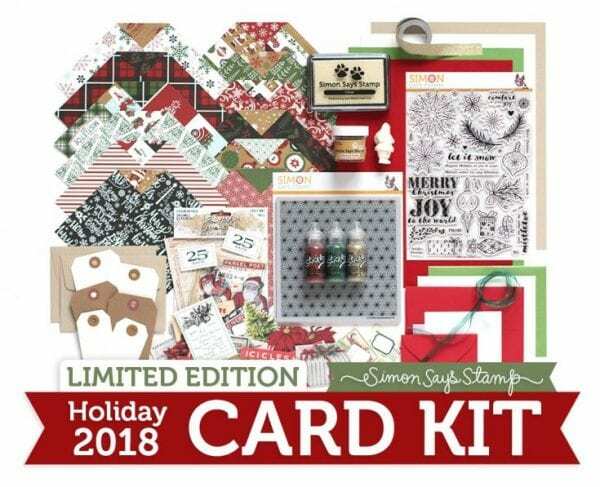 First, let’s take a look at what is included in the kit, but before I do I want to mention that this kit is not included in the monthly kit subscription, it is a special, limited edition kit and once it is gone, it is gone. However, many of the items in the kit are available individually. 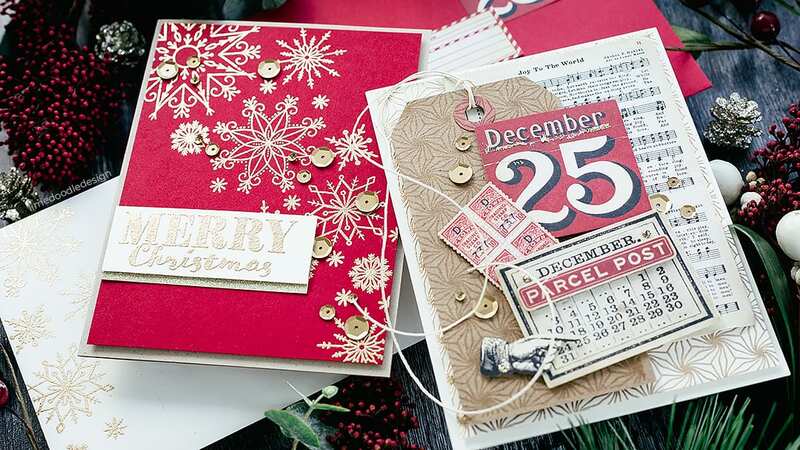 I made a couple of vintage-inspired cards and envelopes from the kit but there are sooooooo many more cards that could be made with the abundant supplies. I started with the gold embossed snowflakes card. I cut a piece of the Schoolhouse Red card and positioned a cascade of snowflakes from the Comfort & Joy set, stamped them in the clear embossing ink and heat embossed with the Antique Gold embossing powder. I mounted the panel on a Neenah Desert Storm card base. I also heat embossed a sprinkling of snowflakes down one side on the Ivory envelope. For the sentiment, I used the same Antique Gold embossing powder and one of the greetings from the Comfort & Joy set and embossed on the Ivory card. I added a piece of the Darice Sparkle Tape to a scrap piece of Ivory card and adhered it below the sentiment piece and then foam mounted the greeting on the bottom left of the panel. Finally, I added a sprinkling of Bronze and Treasure Chest sequins which as it turned out were the only things that I used for this card and envelope that weren’t included in the kit. Next, for the ephemera card, I started by stamping the Poinsettia Background on Ivory card with the clear embossing ink and embossed with the Antique Gold embossing powder. I mounted this panel on an Ivory card base. I also stamped one of the kraft luggage tags with the Poinsettia Background in clear embossing ink for a tone on tone look. I strung the tag with natural twine. I chose a collection of the Tim Holz Christmas ephemera pieces and rubbed Antique Linen Distress Ink around the edges. 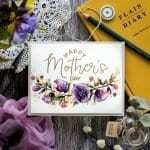 I then added all the pieces to the card with foam adhesive, overlapping them and adding at angles for an eclectic look. I added accents of Tidings Stickles glitter glue and smudged it around a little with my fingers and then finally added a few Bronze and Treasure Chest sequins. I also added a few ephemera pieces to the Schoolhouse Red envelope to match. Again all the supplies apart from the sequins were included in the kit. Gorgeous cards! I really love those snowflakes! Who doesn’t love snowflakes??? Amazingly beautiful cards. Beautiful!! 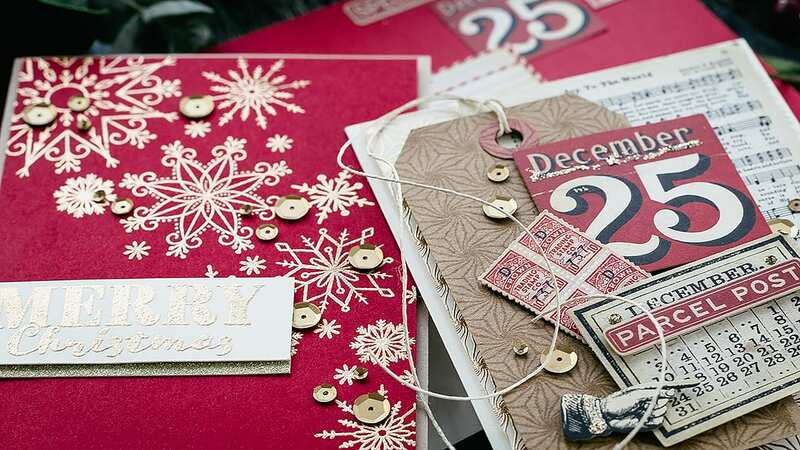 Love the colors you used, and those gold embossed snowflakes are gorgeous!! Love the gold snowflakes on red!